On 30 and 31 March 2012, after seven long years of fundraising, planning, building and work by thousands of people in Cuba and Britain, the newly renovated Miramar Theatre in Havana opened it�s doors for the first time. A spectacular gala performance featured students from all of Havana�s arts schools, and special guests including El�ades Ochoa and his group from Cuba, Lausana Diabat� from Mali, and Cuban violinist based in the UK, Omar Puente. Students of ballet, contemporary dance, circus, acting, singing and music, representing all of the National Arts Schools in Cuba were given the opportunity to perform in the theatre which will be used by them and the local community for many years to come. Jazz violinist, Omar Punte, spent two weeks rehearsing with students to perform two Kirsty MacColl songs that she had recorded in Cuba shortly before her tragic death in 2000. He also played �Adios a un amigo� (Farewell to a friend), composed in her memory and which he played when her family scattered her ashes off the cost of Havana in 2004. Music Fund for Cuba Director, Rob Miller, recalled the moment when he had first seen the decaying and dilapidated theatre on a visit to Havana in 2005. He paid tribute to the thousands of people in Britain and Cuba who had worked tirelessly over seven years on the project: raising money through sponsored events, concerts, fundraising, donations, those who had worked on the project directly, but most importantly to the people of Cuba for their inspiration. The gala weekend took place over two days, and both events were free for people to enter. Many from the local community around the theatre attended, as well as parents, students and teachers from the schools based nearby. The main auditorium was named the Sala de Kirsty MacColl, with a plaque over the door. Everyone who enters the theatre will pass three display boards about the history of the project and charity, the life of Kirsty, and the many activities that British people have engaged in to see the theatre come back to life. Throughout the week before the opening, local people were coming in to see what was happening and visibly elated that the theatre was to reopen. Although the area of Miramar is most known for the international embassy�s based along 5th Avenue, for the people that live in the surrounding streets there is little in the way of cultural attractions close by. As well as being a performance and rehearsal space for the art school�s students, local organisations and community groups will also be able to use the facilities. The inclusion of a screen in the new building means that films will once again be screened, maintaining the theatre�s original use as a cinema. As well as inauguration speeches by Rob Miller and Jean MacColl, the Cuban Minister of Culture, Rafael Bernal praised the work of the Cuba Solidarity Campaign and Music Fund for Cuba in making the Miramar vision a reality. MFFC trustee, and World Circuit record producer Nick Gold also received an award in recognition of his contribution to Cuban music. World Circuit records produced the multimillion selling Buena Vista Social Club album featuring Cuban son artists, and brought Cuban music to the attention of many people for the first time. World Circuit records also donated �10,000 to the Miramar restoration project. Many guests from the UK and Cuba attended the event including diplomats, trade union leaders, Music Fund trustees, and representatives form all areas of Cuban political and cultural life. Renowned Cuban film maker Roberto Chile filmed the opening night and a short film will be shortly be available and publicised on the Music Fund for Cuba website. 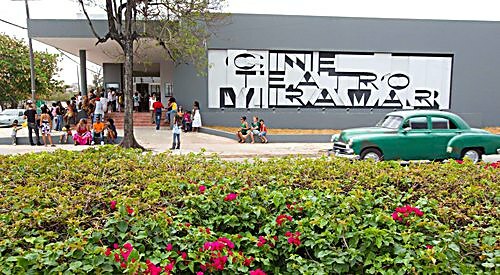 If anyone is visiting Havana and wants to see the Miramar theatre it can be found on Avenida 5 y Calle 94, Miramar (5th Avenue, and 94th street � on the left hand side as you leave the city).